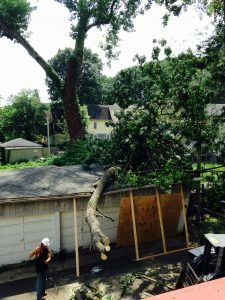 How to Prepare for a Windy Storm - Disaster Restoration Services, LLC. Over the past few days, with the high winds and torrential down pours, DRS has received a few calls about heavy damage from tree’s falling on houses, branches crashing on sheds, and branches going through a few windows. -Maintain regular trimming of the trees and branches surrounding your area, along with cleaning up the debris from them. Without proper trimming, old branches are more likely to easily fall off during a windstorm and the branches can fall on cars, the house, or even damage windows. -Close awnings before a storm is supposed to happen. If you see that the skies are getting darker and hear on the newscast that it will be very windy, it is wise to close the awning if you have one attached to your house. We had one call where the awning that was attached to the house got ripped off and in the process of it being ripped off, it actually damaged the structure of the house due to the violent wind gusts. -Close shutters before the storm/Use storm doors. It is wise to invest in storm shutters so as to protect your windows from wind gusts. Windows are one of the easiest ways for wind to get into the house and to cause damage. -Tie down all patio furniture and outside items that may easily be lifted by a heavy wind gust. Yes, going out in a rainstorm to tie down furniture does not sound fun, however, the alternative could be very costly. Chairs and tables are easily lifted by wind gusts and can fly into anything. Glass tables can shatter and umbrellas can end up 3 houses down the street. If you were impacted by any wind damage from the recent storm, call DRS at 877-280-7961 for all your storm damage needs! Whether it was tree damage, water damage, or fire damage we can take care of it all!